My heart and home feel empty. The other night as I looked over at the big easy chair where Earl Gray usually sits, it was empty too. After 15 years of living with Earl, we had to put him down. We were really blessed when Earl Gray walked into our lives. My husband, Steven, and I came home from a June wedding. It was one a.m. on a Sunday. Waiting for us on our front porch was this scraggly cat with a badly broken leg. The break was internal — no bleeding; it was bad. A few weeks before, we had seen Earl in our backyard. Earl actually belonged to one of my neighbors. We opened our front door, and Earl with tail raised high and curled (a happy sign for a cat) hobbled in. He acted as if he owned the place. Fortunately, I had cat food in our house. A week prior to Earl entering our house, our cat Belle died. She was 19. I found Belle and her brother, Gigolo, at a newspaper office where I worked. It was my first reporting job. I grew up in New York, and moved to southern Louisiana — 3 ½ hours south of New Orleans. Under a production table with piles of newspaper, a cat came in and had a litter of four kittens. I took two, and the other kittens and mom were adopted by my coworkers. I was very close to Belle. Her brother, Gigolo, died at age 15. It was a great loss. Everyone loved Gigolo—even people who didn’t like cats. He was incredibly friendly. Belle, on the other hand, was my cat. She was always by my side. After she passed, I knew I would get another cat someday — but not too soon. Earl had other ideas. A week after Belle’s passing here was Earl on our front porch. Steven told our neighbor that we found his cat. When he said he had a badly broken leg. The owner thanked him and said, bring him to me, and I will have him put down. Steven said no, and we took Earl to our vet. Our wonderful veterinarian, Marc Levine, DVM, in South Orange, NJ, happened to be in his office on a Sunday. I called him because he made himself available to us when Belle got sick. He was always there for us. He looked at Earl and said he seemed healthy, except for the broken leg. He also estimated that he was about five years old. Dr. Levine recommended that we take Earl to an orthopedic veterinarian. Earl came home in a cast, which made one leg slightly longer than the rest. We have steps in our house and Steven put a five-foot barrier at the base of the front stairs. Our goal was to block Earl from climbing up the stairs. We feared that he would tumble down. He surprised us when we came home from work, and found him staring at us from the top of the stairs. Next to him was his cast. I still don’t know how he managed to get it off. He did this several times. Earl quickly became part of the family, and three-and-a-half years later when Jordon was born, Earl had to adjust to a baby in the house. I remember the nurse in the hospital overhearing one of my conversations about Earl to a friend. She later asked me what I was going to do with the cat when I brought my child home. I truly didn’t understand the question, and later learned that some people get rid of their pets when they have children. That didn’t even cross my mind. I remember Earl sniffing Jordon, and eventually, the two of them became buddies. Earl offered us so much comfort. He often sat across my desk when I wrote. We shared a pillow at night. Over the past year, he developed an overactive thyroid, which we treated with medicine and then with a special diet. Within the last few months he started urinating all over the house, losing weight, and his fur lost a lot of its sheen. He wasn’t grooming himself like he used to. Still, he purred when we pet him, and came when we called. He was always underfoot, and we liked it that way. A couple of months ago, I took Earl to our veterinarian. Dr. Levine was on vacation. His partner, Diana M. Knight, VMD, saw Earl. She did a series of tests, and found his kidneys were failing. He had other ailments, which she treated. I brought Earl back a month later, and Dr. Knight saw how scraggly he appeared. He wasn’t fully grooming himself, and his eyes were cloudy. He was thin and frail. She said we could give him subcutaneous fluids, which would buy us some time, but she could not guarantee a good quality of life. Steven gave Belle subcutaneous fluids. It bought her a few good days, but she rapidly declined. So, here I was in the vet’s office with Dr. Knight, who suggested euthanasia. I don’t use that word lightly. I believe in euthanasia for when anyone is extremely ill and has slim to no chances of recovery. Dr. Knight must have spent 40 minutes with me, listening to me go back and forth about what to do. I swear I don’t remember being so muddled. I decided to take Earl home because Steven was away on business. I knew he would want to say goodbye to Earl too. 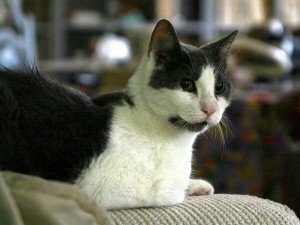 After I brought Earl home, I called Steven, and then made an appointment to euthanize Earl on Monday. We spent the entire weekend with him. One of the hardest parts of all of this was telling Jordon. Jordon knew Earl all of his life, and even though the news broke his heart, I didn’t want Jordon coming home from school and not finding Earl here without knowing what was really going on. I thought he should know the truth. I didn’t want to bring Jordon with us when we were putting Earl down. He said his goodbyes the night before and before he left for school. On the day we brought Earl into the vet, everyone there was completely supportive. Dr. Knight assured us that we were doing a kind thing. We stayed with Earl during the procedure. Dr. Knight comforted us. Dr. Levine came in too, and so did a lot of the staff. They were so caring. Earl left this life in a loving environment. Steven and I got to say our goodbyes. The other night I stared at the empty chair. And when I came downstairs in the morning to start my routine, I felt empty. My morning ritual is preparing breakfast for Jordon and Earl. We all play together and are a family before Jordon goes off for school. It is quiet in my house. We are all feeling the emptiness. Earl has left a big void. I wanted to let everyone who reads this blog know because I did write about Earl from time-to-time. I also wanted to thank my family and dear friends and readers who heard about Earl’s passing. Thank you for your kind words.